Microsoft Gadgets or Desktop Gadgets are a mini widget applications that are designed to do variety of tasks or dedicated purpose, such as display clocks, show calendars, RSS notifiers, show at-a-glance view of online instant messaging contacts, provides easy way to control media player, games, calculators, sticky notes, search tools and more. Microsoft Gadgets can run on the Windows desktop and on the Windows Sidebar, which is the widget engine for Desktop Gadgets, and is a panel found in either the right side (default side) or the left side of the Windows desktop that organizes gadgets and makes them easy to access. Both features are integrated with the Windows Vista operating system and the upcoming version of Microsoft Windows and patches are available to Windows XP and Windows Server 2003 to use the Sidebar and Gadget features. When you purchase and install Windows Vista, it already comes with essential sets. However, if you want to search and find more Microsoft Gadgets available for download for free, Windows Live Gallery at http://gallery.microsoft.com/ (gadgets have been discontinued) is the place you should go, where it’s the one-stop shop to find and search all of the available great useful Gadgets, add-ins, and extensions to customize and personalize Windows Live products and services as well as Windows Sidebar. 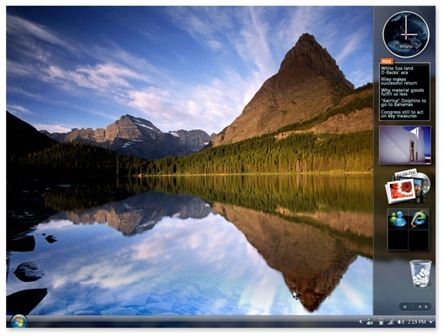 Also on Windows Live Gallery are web gadgets that live on Live.com homepage or Windows Live Spaces blog. Windows Live Gallery is now also the only place for Gadget developers to submit, upload and post English language Gadgets or Macros for use in the US, UK, and Australia. Previously, the Gadgets for Windows Sidebar have been published and made available for download from Gadget Gallery at http://microsoftgadgets.com/Gallery/ (gadgets have been discontinued), which still host Microsoft Gadgets for other countries and languages. Among the Gadgets available are iTunes Songs, MSN Video, Live Clock, Get Windows Media Player, Outlook info, Weather Forecasts, GMT clock, Hangman, Google-bar, Windows Live Mail, Blockade Sidebar Gadget, Gmail Quick login, Poker, Stock Quotes, Shopping, LiveVideo YouTube, Phone Notify, Spikedhumor Daily, Sudoku Assistant, Postage Calculator (UK), Uptime Gadget and many more. Best of all, no costs involved, download Gadgets for free. 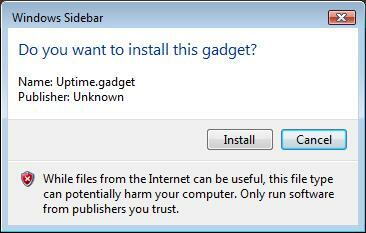 After you download the Microsoft Gadgets .gadget file on to the computer, execute the installer and answer “Install” when prompted with a Windows Sidebar pop-up message to install the gadget. After installing the gadget file, click the plus sign at the top of the Windows Sidebar pane to make the new gadget available and shown on desktop. Gadgets uninstallation is easy. Simply right-click on any gadget that you want to uninstall and select “Uninstall”.